Correction about Muppet's Story and Good News! 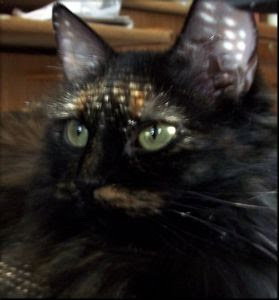 I had posted a story on a previous Tortie Tuesday about Muppet and her awful experience at F.L.O.C.K. but I had made a mistake in the details that I would like to correct. Muppet was NOT rescued by Best Friends but rescued by her current Mommy who then alerted Best Friends to the horrors of what was going on there. Our Mommy feels terrible about the omission and apologizes to Muppet's Mom for not giving credit where credit is definitely due. Thanks to this wonderful woman, so many cats were rescued from a horrible situation. Okay, here's the really good news! Muppet had been previously misdiagnosed with a brain tumor and they went and had new tests done to find out it's not true! I'm so happy to hear this and I know that Muppet will be back to feeling good soon. She still has some healing to do(and possibly another surgery) to get off the pain medications so I'm sending my purrs and Tortie-love to Muppet and her Mom. Good news for Muppet! We are glad she is doing better ans has a wonderful furever home! Dat is wonderfur news for Muppet, so glads to hears dat kitties gots out of bad situation alongs wif purrty Muppet! I second Baby Patches, good news all round, and welcome news too. That is great news for Muppet. Well done to her mum for saving her and helping the other cats. Wow, what great news for Muppet! We're sending our love to Muppet! That's a beautiful sun-dappled picture of you Delilah! We are so happy to hear about Muppet not really being sick! How could anyone make such a mistake. And kudos to the lady who rescued all the kitties -- I'm all fur that! Wonderful news for sweet Muppet! She is a precious dear!!! Thanks so much to Muppet's mom for rescuing her AND contacting Best Friends. We know Best Friends rescued many many cats from FLOCK and is helping them - so she did a very good thing. And we're very glad Muppet's tests had such a good results. I hope Muppet continues to feel better and better effurry day! We're glad to hear that Muppet's mom saved her and helped those other kitties! And it's great news that Muppet is going to be feeling better very soon! Purrs to her! Yay! We're glad it's good news for Muppet! !